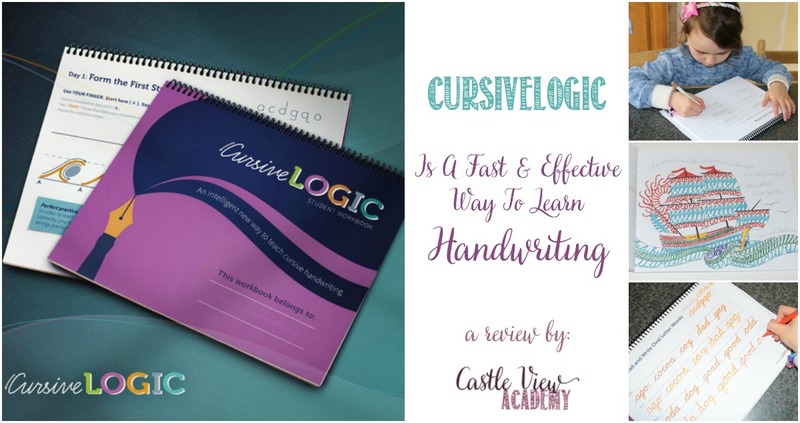 My daughter has been jealous of her big brother learning to write in cursive so when the opportunity to review the CursiveLogic Quick-Start Pack and The Art of Cursive by CursiveLogic you know who was first in line! Sometimes learning to write in cursive feels like it takes forever with all of the repeating of individual letters over and over again. 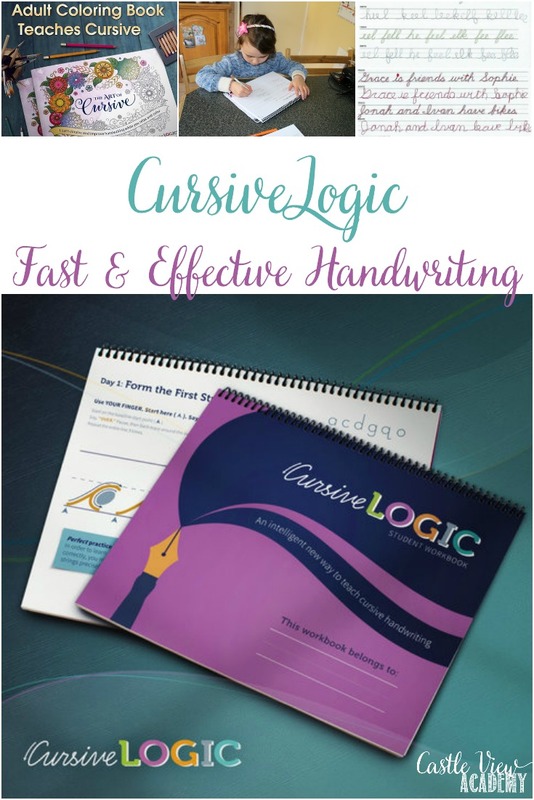 CursiveLogic has developed a way for children to learn to write in cursive very quickly by learning in batches of letters based on their structure. By the end of the first week, children will already be writing words, which gives them confidence and staying power to the concept. The CursiveLogic Quick Start Pack includes both the CursiveLogic Workbook as well as a webinar to help you teach your children. Kallista began watching the webinar with me before our package arrived over the Atlantic so we knew what to expect. 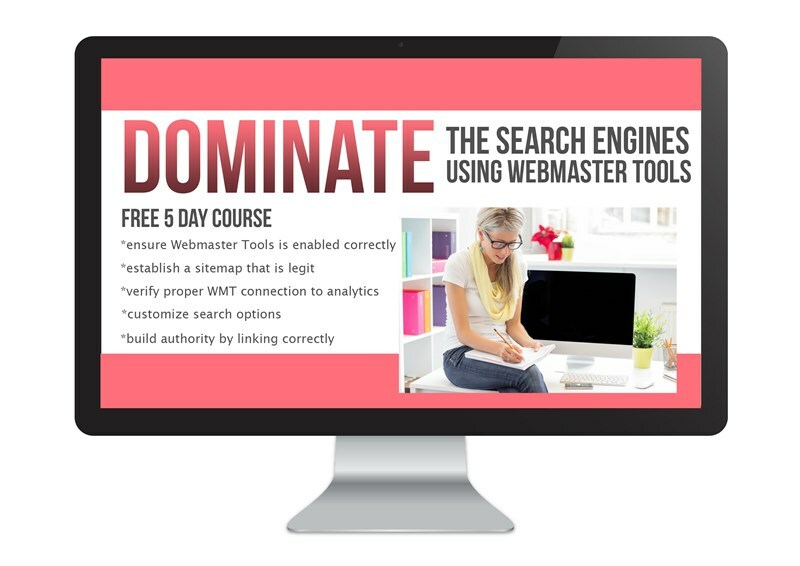 The webinar teaches the teacher how to teach this course. Since I was only going to be teaching one of my children through this method, Kallista watched along with me rather than me watching and then repeating what was already in the webinar. We watched the introduction and techniques up to the point of the first lesson. There is also an emphasis on correct posture; how to sit, how to position your paper, and how to hold your pen (for both right and left-handed writers). When children have this all right, you can actually see the difference in the neatness of their work and get to know just by looking at their writing whether they’ve used the correct positioning! After our CursiveLogic Workbook arrived, Kallista wanted to get started immediately! We then played the webinar through the first lesson and she was on her way with the first grouping of letters, known as the Orange Oval Letters. The lessons are set up in a format of tracing over the letters with either your fingers or a pencil/pen/marker, etc., then doing some practice on your own. Each set of letters has a particular phrase that goes with it to help children with the formation of the letters. Kallista gave it her best try for this first attempt of cursive writing. She wanted to keep going and going and would happily have completed the whole book in a few days if she could. I did let Kallista do a little extra here and there, but not as much as she wanted because I wanted the brain-muscle memory to have time to sink in between sessions. Kallista kept up in this way each day, first watching the relevant part of the webinar and then working in her workbook. The lessons are colour-coded and Kallista enjoyed doing her work in the relevant colour to make it more interesting. The lessons are structured around a four-day teaching week which worked well for us. The complete lower case can be learned within 4 weeks! The next part, now that you know all of the lowercase letters is to learn how to sign your own name. 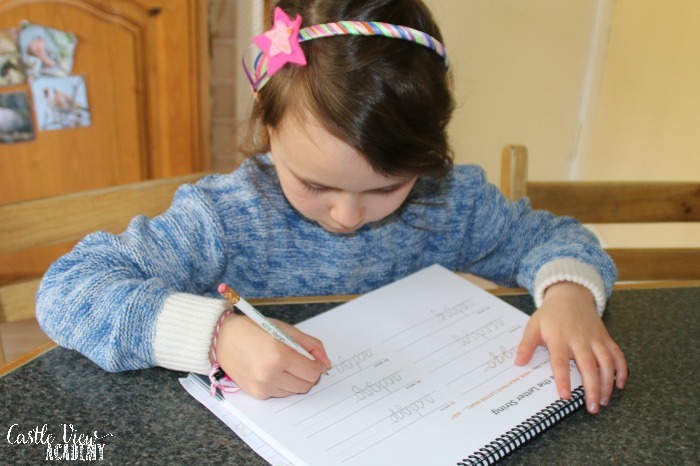 So children first learn the uppercase letters they need to know and then they’re off with their very own signature! Then the uppercase letters take an additional 6 weeks to work through; again learning them in groups of 3 – 5 letters each week. These are taught at the same time that lowercase letter reinforcement occurs so that the previous work has not been lost. The samples above are about 2.5 weeks apart. You can see the unsteady, shaky script of a new beginner in green, and now in red, the letters are more fluid. Granted, there’s still work to be done to perfection but after 4 weeks, this isn’t bad for a 7-year-old! I love Kallista’s last line where she expresses her love for her big brother! Once the lessons have been completed, there is some extra practice at the back of the Workbook to return to on a weekly basis or so to keep up the practice so all the hard work isn’t lost. I should also mention that there are 3 laminated pages at the back of the book that children can use with wipe-off markers for additional practice of the lowercase letter shapes and to get their confidence up with some of the letters and words before using the paper pages for each of their lessons, if needed. This is a nice touch. 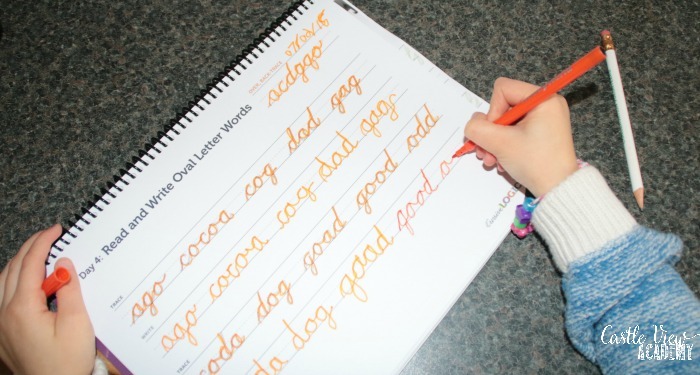 There are also some suggestions of ways for children to continue to use their cursive writing in ways other than doing homework. 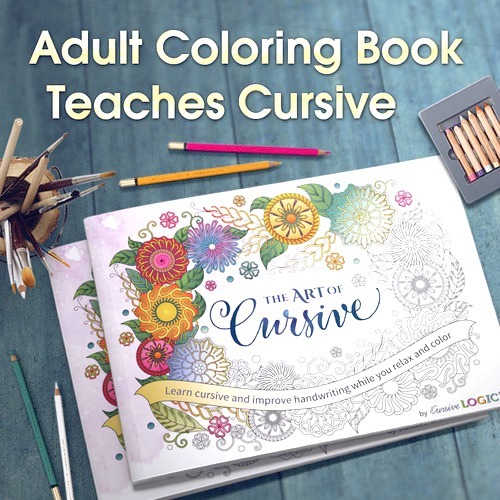 One way for children, or adults, to have some fun while keeping up their cursive skills is through the Art of Cursive adult colouring book. As I mentioned earlier, Tristan has been working on his cursive for a couple of months already, so I let him work on the colouring book for a bit of a change. 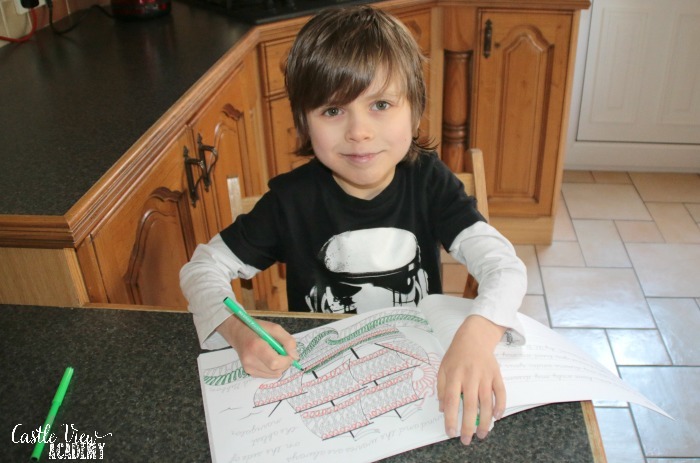 At the front of the colouring book is a brief over-view of the CursiveLogic strategies, and then there are 27 pictures to colour that all incorporate handwriting into them. Usually, adult colouring books are more targeted towards stereotypical females, but I’m happy to say that there are lots of pictures in this book that will appeal to people of all ages, abilities, and interests. One one side of the page is a picture, on the reverse of the page is the same quote over which you can trace, as well as blank lines below for you to write it out yourself. I’m really quite impressed with this colouring book, but the one suggestion I would make for future editions is to put the quote on the page opposite rather than on the flip-side so that it sits next to the picture. The CursiveLogic style of teaching is much swifter than other programs as letters aren’t taught individually, and words are being written in the first week. The lessons are quite short so students don’t become over-taxed and frustrated. After just 4 weeks, Kallista is already comfortable with her lowercase letters and happily working half way through the uppercase letters. She is so happy to actually be ahead now of where her big brother is with the cursive program he’s been using since the start of January! And of course, she’s also two years younger. Would I suggest you need to purchase all of these products? Not necessarily. 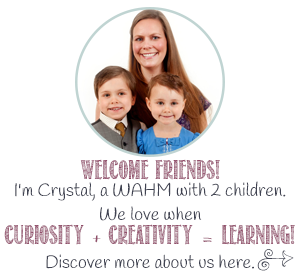 Unless you are going to be teaching several people, then you may not find the webinar to be as high a value – but then again, if your children give more weight to someone who isn’t ‘mom,’ then having them watch the webinar video before each of the lessons could very well work for you! This is a personal decision based on your own circumstances. 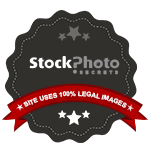 The CursiveLogic Workbook, of course, is the main component without which you cannot do this program. 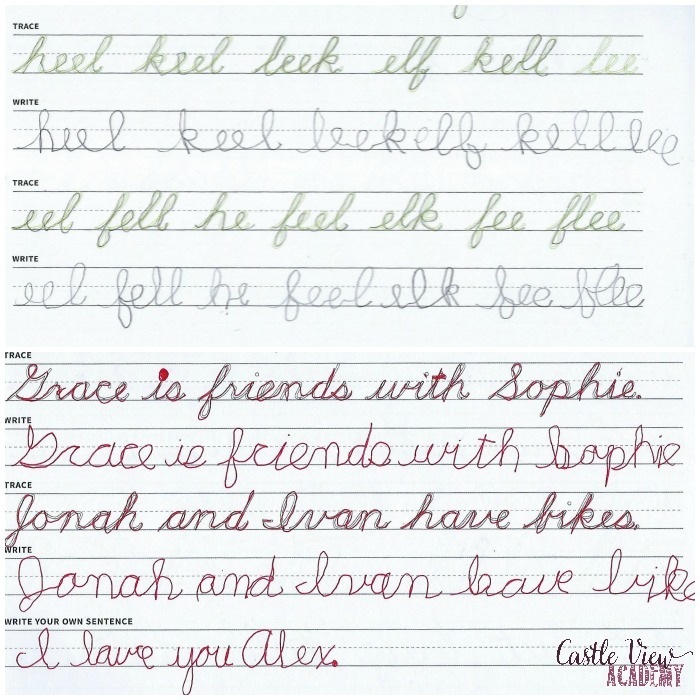 The Art of Cursive isn’t required, but it is lots of fun for the students as a reward after a great lesson, or as a gift after completing the course. Or use it yourself and have your children see you having fun with cursive to give them more motivation! So does CursiveLogic work? I would have to say yes it does, as you can clearly see from our review. Would I recommend it? Yes, I would! It isn’t complicated or drawn out, yet it does give lots of practice, and we can see the results and the improvements made each week, and even each day. I really like how they teach cursive in a fun way​. They teach you lowercase and uppercase. When they teach how to write uppercase in cursive you can make up your own sentences in cursive. To read more reviews about CursiveLogic by the Homeschool Review Crew, click on the graphic below and follow the instructions. You will find 100 honest reviews by the Crew. 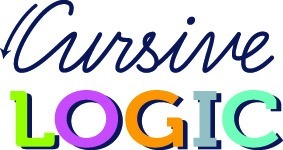 If you’d like to know more or would like to follow CursiveLogic, you can connect with them through their website and Facebook.